Sri Lanka’s largest city was once dotted with freshwater marshes. The picturesque beauty of the wetland areas, say elders, was breathtaking. Not any more. The marshes have been filled to construct buildings. The remaining ones are highly polluted and taken over with invasive plant species. It is for this reason that in the past few years Colombo has witnessed widespread floods. The city braved the severest of flood events in 2010 that left almost 50,000 people homeless, says Anoja Seneviratne, assistant director at the country’s Disaster Management Centre. With round-the-year rainfall and heavy showers twice a year, the city’s roads go underwater at least twice a year. The country’s marshlands, called nature’s sponges, no longer play their role in preventing floods. During heavy rainfall, marshes absorb water, slowing runoff into streams and reducing flood peaks in downstream areas. 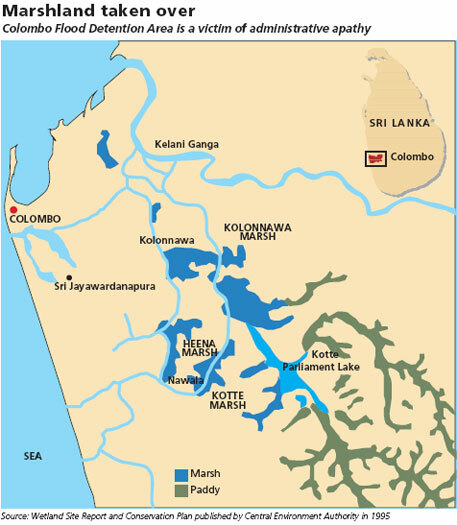 The four marshes in Colombo district—Kolonnawa marsh, Heen marsh, Kotte marsh and Parliament lake (see map)—that form the Colombo Flood Detention Area (CFDA), are dying. The area suffered a big blow in the early 1980s when Jayawardhanapura Kotte, in Colombo district, became the new developmental hub after the parliament building was constructed. Most of the institutions shifted to this area. The rate of land reclamation increased as the country implemented the National Urban and Housing Development Policy of 1978. The National Housing Development Authority and the urban development authorities acquired low-lying marshland areas which were available at cheap rates. They filled them up and constructed houses. Research institutes, ministry offices and IT industries were also built there. “The state completely forgot that CFDA was performing the task of containing floods,” says P K S Mahanama of faculty of architecture at University of Moratuwa in Sri Lanka. Twenty-five per cent to 35 per cent of Colombo district’s area comprised marshlands before the country’s independence, says Mahanama. This has decreased to 10 per cent. Kolonnawa marsh, the biggest in CFDA, comprises a series of freshwater marshes. Draining into the Kelani Ganga in the north and Colombo Canal system in the south, Kolonnawa had paddy fields, fresh water and local plant species until late 1970s. The paddy fields were cultivated and the water taken by people for day-to-day use. Increase in population led to encroachment of paddy fields. Kolonnawa is now cut off by townships, densely populated shanties and semi-urban settlements, says Deepthi Wickramasinghe, lecturer at Colombo University. The 214.5-ha marshland has shrunk by about 20 per cent. Worse, leather tanneries and piggery farms located close to Kolonnawa discharge their waste into it, states a 1995 Central Environment Authority report. The freshwater marshland is now black and stinks. 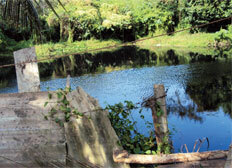 Residential areas built upon Kolonnawa have a huge role in polluting it to the brim. “No separate sewage disposal system was ever built for the area. Toilet waste is directly discharged into the marshland. 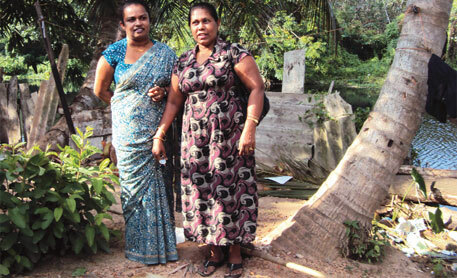 We have no alternative,” says Kanthi Kaluarachchi, living in the area for over five years. “The stench is unbearable. During heavy rains, dirty water enters our houses and we have to vacate them for weeks,” says Biatrix Gamage who has been living near Kolonnawa for more than a decade. The count of faecal coliform bacteria has reached almost 23,000 per 100 ml. This is almost 23 times the standard value fixed by the World Health Organization, says Wickramasinghe. If the count crosses the set standard, it may cause dysentry, viral and bacterial gastroenteritis, and hepatitis A. Toilet waste has also increased phosphate level in the water to almost nine times the ambient water quality standard (0.1 mg per litre), causing eutrophication, or excessive growth of plants. Invasive species like pond apple (Anona glabra), which are woody trees, have formed a cover over a large portion of the marshland while their seedlings carpet the ground preventing native species like grass and sedges from thriving. “Its roots are very deep-seated and choke the marshland. They should be removed as soon as spotted,” says Wickramasinghe. With the authorities failing to check their spread, the invasive species hinder in absorption of water. Government agencies have also done their bit in polluting the marshlands. Garbage dumping by them is a regular feature, says Wickramasinghe. A review of their water quality by researchers Missaka Hettiarrachchi and Wickramasinghe in 2010 revealed its biological oxygen demand, a parameter to indicate pollution, is double the Sri Lankan standard. To revive the services marshlands provide, Dinesh Gunawardana, Minister of Water Supply and Drainage, recently announced it will construct water tanks in low-lying areas. A huge step towards conservation was the Fauna and Flora Protection Ordinance, says Mahanama. The Act came into existence in 1937 but has been amended many times, the last in 1996. Under this, the department of wildlife conservation declared many marshlands as sanctuaries. Of the four marshes in CFDA, government declared Kotte marsh as a sanctuary. “Kotte may have been chosen because after the parliament was built, the area became politically very sensitive,” he says. Awareness programmes were also started by Netwater, a non-profit of women water professionals. They started campaigns in schools and held meetings to start a dialogue between policy makers and environmentalists. In 1992, government had established a Wetland Management Unit under the Central Environment Authority to identify and conserve the wetlands in Sri Lanka. But the unit closed in 1999 and the Central Environment Authority took over its work. The efforts have not yielded enough positive results though. A committee set up in 1984 under the Sri Lanka Land Reclamation and Development Corporation to check filling of marshlands failed to formulate a monitoring system. “Non-involvement of departments makes the process complicated,” says Mahanama. Absence of the law simplifies the process of filling up marshlands. But the recent hue and cry over filling up six man-made tanks near Sriyawewa, about 240 kilometres from Colombo, for a 581 ha sports complex is a ray of hope for the people of Sri Lanka.